Julia Mancuso said Tuesday the U.S. Ski Team’s training camp, which is currently underway at the Speed Center, is giving her a lot of hope for the season. 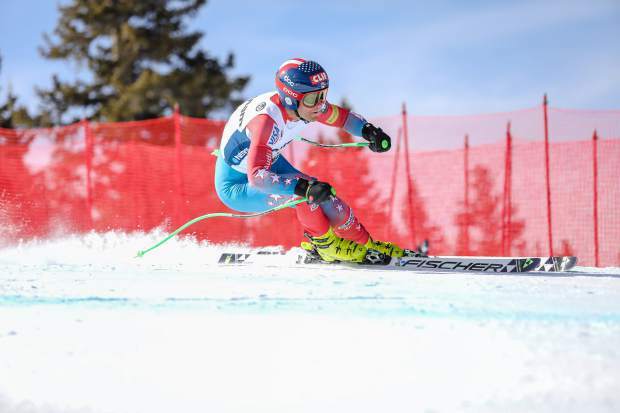 Mancuso is recovering from hip surgery which she received in Vail at The Steadman Clinic, and is hoping to make a return to the Olympics later this season, which would be her fifth time skiing at the Games. “I’ve had a lot of breakthroughs in this camp, which has been really nice,” Mancuso said. Mancuso’s teammate Alice McKennis — an Aspen Valley Ski Club alumna — said the Copper Mountain course has been a lot of fun to ski on. “I was only four-hundreths off the podium, and the girl in front of me, the girl in fifth, was a hand time, so I’m still holding a grudge about that one,” Cook said with a laugh, in reference to a rare technology glitch that occurred resulting in two athletes receiving hand times rather than electronic results. “Any time a hand time goes one hundreth in front of you, you’re like, ‘that’s wrong,’” Cook added. Dry, man-made snow like Korea’s allows racers to better feel the fine details in their equipment which can make a difference, Cook said, adding that for those reasons, the Copper Mountain training camp has been helping technicians as much as racers this week.